Minty fresh and overflowing with renewed energy as Dr. Dre finishes twiddling the knobs on his hugely anticipated third album, Anderson .Paak is back with a bang. Making a huge return to New Zealand, the Californian singer, rapper and producer arrives armed with his newest singles ‘Til It’s Over’ and ‘Bubblin’ – two new slices of trademark realness. Originally from Oxnard California, Paak was first exposed on Dre’s final album “Compton”, as he was given space to showcase his considerable skills. He then sent eager ears into overdrive with the release of the Grammy winning album “Malibu” featuring killer collaborations with Kaytranada (‘Glowed Up’) and Snakehips (‘Money On Me’). The first Anderson release arrived in 2013 as an all-covers EP, “Cover Art: before issuing a full album “Venice” a year later. 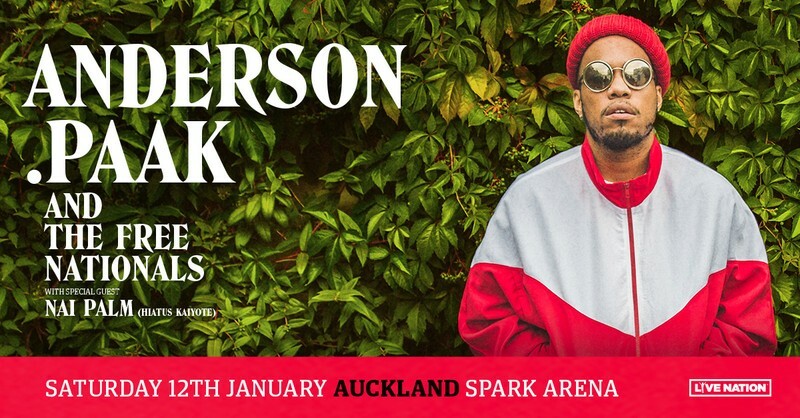 Grammy nominated composer, instrumentalist, producer, vocalist, poet and frontwoman of neo-soul quartet Hiatus Kaiyote, Australia’s NAI PALM will join Anderson .Paak as special guest in Auckland. After selling out their 2018 New Zealand tour in just minutes, fans will need to move fast in order to secure their spot for what’s sure to be one of summer’s best festival sideshows.